Demand for best execution has given rise to a new industry in FX transaction cost analysis. Boston, March 25, 2015 – More than ever before, buy-side firms are treating foreign exchange as a separate asset class and source of alpha and are actively hedging FX exposure. 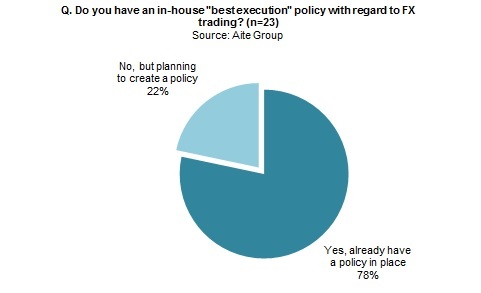 As asset owners begin to embrace a best-execution philosophy and the use of electronic trading tools and FX transaction cost analysis increases, institutional asset managers and corporate treasurers must take a bigger fiduciary role in demonstrating FX best execution. This research looks into trends in electronic and algorithmic FX trading, adoption of best-execution practices and FX TCA, alternative FX benchmarking methods, and buy-side clients’ preparations for the eventual mandatory clearing and reporting of FX nondeliverable forwards. It is based on a data from a 2014 online Aite Group survey of 27 buy-side fund managers and corporate treasurers. This 48-page Impact Report contains 34 figures. Clients of Aite Group’s Institutional Securities & Investments or Wholesale Banking & Payments services can download this report.